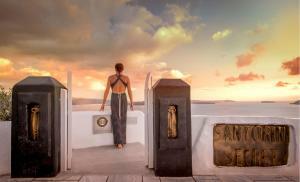 The Santorini Secret Suites & Spa, located on the volcanic rocks of Oia, is a 5 star boutique hotel offering suites with views of the caldera and the volcano. 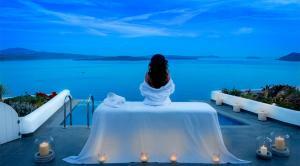 Reservations for more than 5 suites may be subject to special conditions, supplements and cancellation conditions. For more information, guests should contact the property. This suite features air conditioning and a panoramic balcony with a private outdoor hot tub, sun loungers and an outdoor dining area. In addition, 1 has an open-plan bedroom, a flat-screen TV, a seating area and a bathroom with a bathtub or a glass shower cabin with a hydromassage function. This air-conditioned room offers views of the caldera and a large panoramic terrace with a private outdoor infinity pool. In addition, 1 has a spacious bedroom with a round wooden bed, an adjoining seating area and a private fitness area. The bathroom includes a hydromassage shower and a separate steam room with rain shower, aromatherapy, chromotherapy and tropical music. It includes a flat-screen TV and a minibar. This suite has views of the caldera, air conditioning and a private balcony with an outdoor pool, sun loungers and an outdoor dining area. It also has a spacious 1 bedroom, adjoining living area and bathroom with bathtub or glass shower cabin with hydromassage function. It includes a flat-screen TV and a seating area with a sofa. Open plan suite with views of the Caldera and panoramic balcony with private outdoor hot tub, sun loungers and outdoor dining area. It also includes a seating area and a bathroom with a glass shower with hydromassage jets. Suite with private terrace with outdoor hot tub, sun loungers and outdoor dining area. There is also a spacious 1 bedroom with an adjoining open-plan living area and a bathroom with a spa bath or glass shower cabin with hydromassage function. The suite is soundproof and has air conditioning and a private entrance. The 3er guest can sleep in an extra bed or on the sofa. 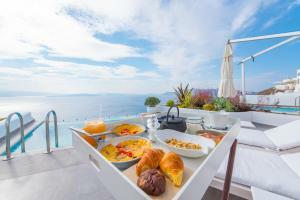 Suite with caldera view, private terrace with infinity pool, sun loungers and dining area. It also includes 1 spacious bedroom, separate living area with spectacular sea views, interior staircase and bathroom with glass shower cabin with hydromassage function. The suite is soundproof and has air conditioning and a private entrance. The Secret Villa has 2 floors and is located 50 meters from the main building. On the main floor there is a spacious bedroom with a four-poster bed, a spacious living area with a sofa bed, a fully equipped kitchenette and a bathroom with a hydromassage shower. It opens onto a patio with dining area, hot tub and outdoor pool with sun loungers and partial sea views. On the upper floor there is a large bedroom with a four-poster bed, an open-plan living area and a large bathroom with a hydromassage shower. 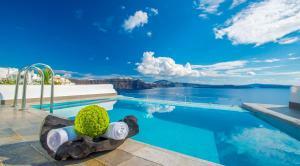 It opens onto a large porch with dining area, sun loungers and panoramic views of the caldera and eastern Santorini. Villa with a terrace with a hot tub and sun loungers, an open-plan bedroom with a four-poster bed and a bathroom with a shower. 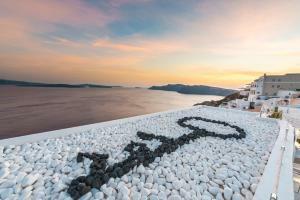 It is located at 50 meters from the main establishment, on the famous pedestrian street of Oia.